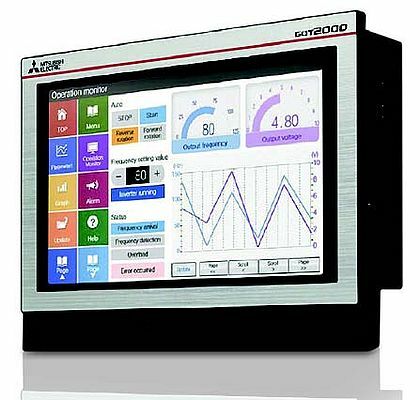 Two new widescreen versions of the popular GOT2000 HMIs have recently been added to Mitsubishi Electric’s range. The wider display format is designed to allow users of the GT21 and GT25 models to display additional screen information for enhanced machine operability and improved user experience as well as the ability to increase productivity. Key additional features include dual Ethernet ports for network segregation (GT25 model only), a built-in sound output interface that can be used for spoken alerts or feedback and an optional wireless LAN module. The GT21 is an entry-level 7” widescreen HMI offering WVGA resolution and featuring on-board Ethernet, CC-Link IE Field Basic, RS-232 and RS-422/485 connectivity; whereas the premium GT25 is available in 7” WVGA and 10” WXGA. The GT25 adds a second Ethernet port for increased flexibility, allowing users to physically separate information and control system networks and set different IP addresses for each network, which helps to promote increased security and safety as well as network flexibility.